Rev. 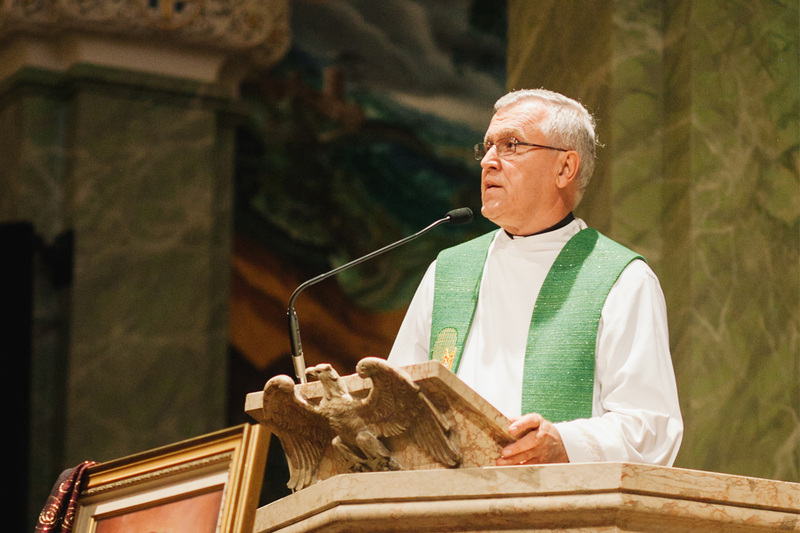 Božnar has been the pastor of St. Vitus Parish since 1979. He graduated from John Carroll University with a Bachelor of Arts degree as a history major, as well as having a Masters of Divinity degree from St. Mary Seminary. Before being assigned as assistant pastor to St. Vitus Parish in 1972, Rev Božnar was assistant pastor at St. Felicitas Parish for two years. Previously a teacher at various schools in the diocese of Cleveland, Sister Avsec is a Pastoral Minister at St. Vitus, serving parish needs such as seniors, liturgical, and outreach. She is also part of The Sisters of Notre Dame (Chardon, OH), a religious women’s order with ministry in education. Marge has been the full-time secretary of the parish since 1993, responding to parishioner inquiries, helping organize and contribute to parish events, and consistently producing the weekly bulletin in that time. Prior to her work at St.Vitus, Marge was the secretary at a local doctor's office. Betty is the parish's evening & Saturday secretary, and is actively involved in our food bank program as lead coordinator. Previously, Betty was a member and officer of the Mother's Club, a member of the Summer and Fall Parish Committees, and has served on the pastoral council. Betty has also worked in the insurance and banking industries. As Finance Director, Stane oversees fundraising for St. Vitus Parish, including the Mihevc Grant Program (scholarship). He graduated from Ohio University with a Bachelor of Science in Communication and a minor in Business, and holds a para-financial planning certificate from the College of Financial Planning. For several years, Stane previously worked for Key Bank. Joe graduated with a Bachelor Degree in Business Administration from John Carroll University, and served as a Cost Accountant at various manufacturing companies in northeast Ohio. He is actively involved in parish organizations and fraternal benefit societies, primarily the American Slovenian Catholic Union (KSKJ) as a National Board of Director. A graduate from John Carroll University, Rudy became a teacher and also worked with young individuals with behavioral problems. Since its opening in 2000, Rudy has served as the manager of St. Vitus Village, an independent seniors living facility operated by St. Vitus Development Corp. Visit our Parish Grounds page to learn more about the village. Upon his retirement at a local firm, Mario has served as a volunteer at St. Vitus Parish, primarily responding to the needs of seniors and also for the parish's St. Vincent de Paul Society. Mario graduated from John Carroll University. Mr. Srsen has lead the music of St. Vitus as choir master for the 9AM Choir since 1977. He is also music director for the Saturday Slovenian School and is the music director for two choral groups in Cleveland, Ohio. Mr. Coffelt performs as the organist and choral director for LIRA, the parish choir at the weekly 10:30AM Sunday Mass. Individuals interested in joining LIRA should contact the parish rectory at (216) 361-1444.